Hi everyone! Hope your week has been great. I squeezed in some outfit shots prior to visiting a friend the other day. Lately, outfit decisions have been pretty tough as my bump keeps increasing on a daily basis. My pants no longer fit and I am enjoying the whole transformation. Learning and understanding my pregnant body has been interesting. In this post, I am wearing a stylish and comfortable Zara harem pants which I have had for years. Keeping it simple, I chose a v-neck tee from Forever 21. I always stock up on white v-neck tees for versatility as I can pair them with different items. For a brighter look, I wore my mustard Zara blazer and paired it with my Michael Kors bag which has become my go-to bag. I wore a beige stiletto pumps to complete the look. Thank you for reading...talk to you soon! You look amazing and what an amazing outfit. In love with those pants and great jacket! it's so funny... you barely look pregnant, so slim... but yet, your pants dont fit. Same thing happen to me around 13 weeks. May I suggest a belly band? it will allow you to keep some of your favorite pants in rotation! the colors are so good together! 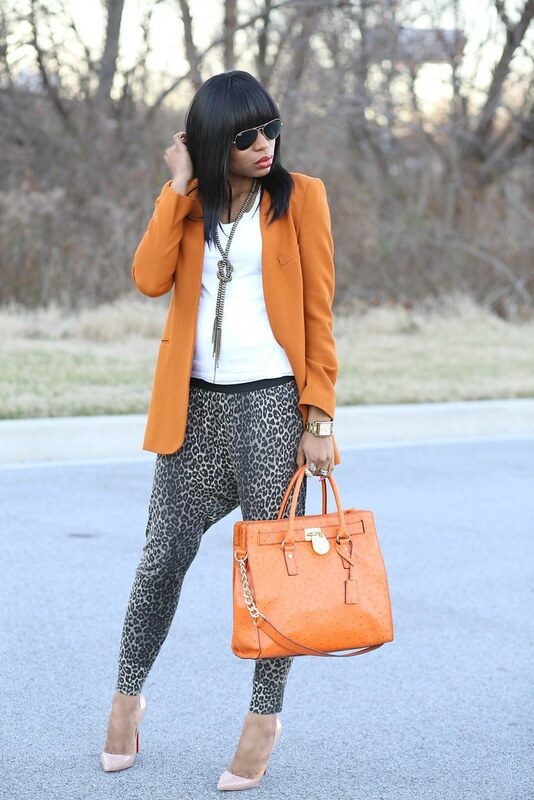 love this orange blazer!! perfect! You look Gorgeous! Lovin that knot necklace, and orange purse! Still looking gorgeous girl. Who makes the necklace? Beautiful as always! I would also suggest the band to keep your favorite pants in rotation throughout your pregnancy! gorgeous combo I love the coat! and the shoes to die for! I adore the jacket, the colour is beautiful! You look great! Love the outfit. Those heels are rather...high. Perhaps you should think of going lower. Please. @josie renee: LOL! It is quite interesting because I have gained much except my stomach hips area; therefore, I can hardly buckle any pairs and if I do, it is super uncomfortable. I will definitely check out the belly band...thanks dear! To everyone, THANK YOU! I enjoy reading all your comments and I appreciate the love and support and motivation. Girl you are already one HOT preggo mama!! ;-)!! Love this outfit! Gorgeous! love that this outfit looks comfortable as well. Great coat and bag, you look amazing! Love the jacket and bag. Great look! Congrats on your pregnancy! I cant wait to see if you still post as get further along! gorgeous!the color of your coat is perfect! That blazer is amazing! I really love the color and your shoes are just beautiful! Beautiful outfit. I love the mustard jacket. And a big, big Congratulations to you and your hubby. I can see the baby bump. my 2 favorite : leopard and orange. Did something 'similar' for my latest post.... of course only similar :) you rock this look. Super cool. Love your style! Damn you look lovely! I am so inspired by your looks. love that blazer. Im a new follower of your blog and glad I found it. Keep up the great work! I love the whole outfit starting with the shoes-being a shoe-holic. You look stunning in this outfit!! I'm a new follower of your blog and I love your style! !